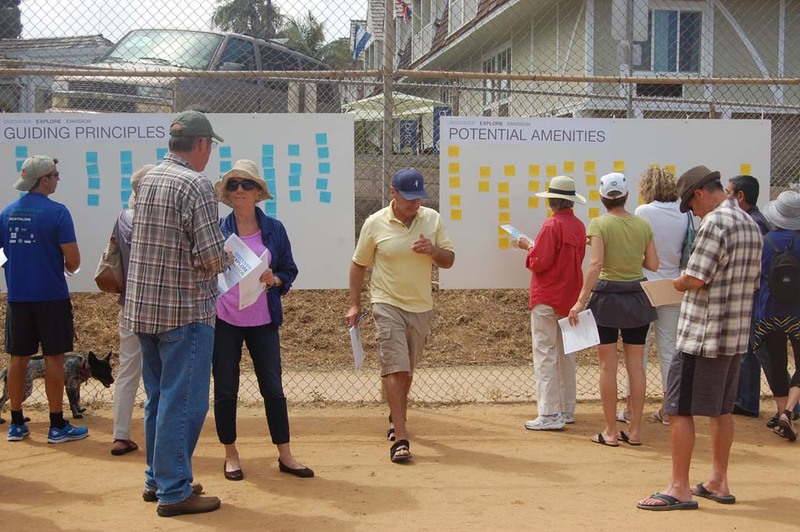 DEL MAR — Shared use between people and pets, passive areas where children can play and benches to sit on and enjoy the ocean view were among the most requested amenities during a Plan Your Park workshop held to garner input on how best to develop the Shores property. About 150 people were on hand for the May 2 event that took place on the 5.3-acre site on Ninth Street and Camino del Mar purchased for open space and recreational uses by the city from the Del Mar Union School District for $8.5 million in 2008. The workshop is one of the final input-gathering events in the “discover” phase, which began in November, to learn what people like to do for recreation. Ideas also came from interest group interviews, informational pop-up booths at community events and MindMixer, an information-gathering tool at engagedelmar.com. A survey was also conducted. Results should be presented to City Council in June, according to the design consultants. Use of the park became controversial in 2011, pitting dog owners, who allowed their pets to run off leash, against Little League participants and parents with young children, who cited health and safety issues. Council members ultimately adopted a plan, still in place, that limits off-leash dogs to certain hours on specific days. Many dog owners said they would like to see that policy continued as is, or with extended hours. Former City Councilwoman Gay Hugo-Martinez said city officials need to “plan a park that fits the demographics of Del Mar,” which she claims is increasingly the 55 and older group. According to 2010 census data, about 21 percent of the 4,161 people who live in Del Mar are 65 or older, 44 percent are younger than 44 and 1,455, or 35 percent, are between the ages of 45 and 64. “Open space with no fences for dogs worked wonderfully,” she said. Hugo-Martinez, like most dog owners at the event, said people who bring their pets to the park respect the hours and pick up after their animals. Not everyone agreed with comments made by dog owners. “We love dogs but we’d love to see them have their own area,” said resident Stephanie Mansolino, who brings her two young children to the park two or three times a week. “The city needs to do a better job enforcing the rules because people don’t pay attention to the hours,” added her husband, Ray, who said he recently saw a Doberman running around during non-off-leash hours. The Mansolinos disagree with dog owners who say most are responsible. They said leaving behind pet waste is “standard operating procedure” and not the exception. “There’s always something on the ground,” Stephanie Mansolino said. The Mansolinos said they support grassy areas, picnic tables, no playground equipment and a path where their children can ride bikes or scooters. During the workshop people wrote their ideas on Post-its and placed them on boards marked as guiding principles or potential amenities. There was also an area where kids could post drawings of what they want the park to look like. Eva Schmitz drew a large dog that her mother said was the family pet. Her brother, Wylie, wants something a bit more extravagant. He drew a water slide. Their mother, Amanda, said she favors mixed use because her children are used to being around dogs. “It would be nice to have somewhere besides Dog Beach that’s more family friendly,” she said. The beach known as “Dog Beach,” which is located at the north end of the city, is the only other area in Del Mar where off-leash canines are allowed. “Create,” the final phase, should conclude in April 2016. “Right now we don’t have an agenda,” said Schmidt, who provided a barbecue lunch after the 90-minute workshop. “This is a gradual process where we’re working toward alternatives. “We’ll eventually come back to the community to help with the design,” he added. Comments and ideas can be sent to kcrane@delmar.ca.us. In addition to benches, picnic tables and mixed use with no fences, there were requests for shade trees, gardens, a bike jump and a fitness trail.